Prasad holds an important place in the Maha Navratri festival. Nine different incarnations of Goddess Durga are worshiped and nine different prasad or bhog are offered to each form of Maa Durga. This is the time not to eat rich, spicy foods but to adhere to discipline. Ganesha advises you follow the strict vegetarian diet (including foods without onion and garlic) throughout the festival. Pray to Maa Durga from your heart and offer her nine different prasads. 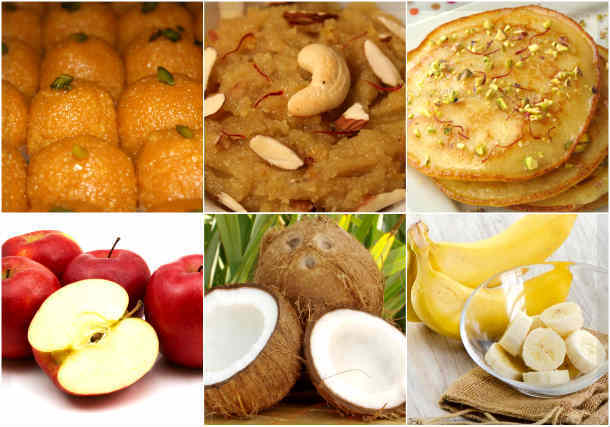 Let’s check out which nine prasad you should offer to nine different incarnations of Maa Durga. Day One: Offer Pure Ghee to Devi Shailputri. Day Two: Offer Sugar to Devi Brahmacharini to enhance Longevity of your family members. Day Three: Offer Kheer to Devi Chandraghanta to drive away all pains and welcome joy and happiness. Day Four: Offer Malpua to Devi Kushmanda in order to improve your intellect and decision-making ability. Day Five: Offer Bananas to Devi Skandamata to be healthy and physically energetic. Day Seven: Offer Jaggery as prasad to Devi Kaalratri and be free from all the pains, obstacles and bring happiness. Day Eight: Offer Coconut to Devi Maha Gauri. It will bestow the childless couples with children. Day Nine: Offer Sesame Seeds to Devi Siddhidatri, so that you will be safe and secured from unnatural events like the accident, calamity or death. This Navratri, bring home the Saraswati Yantra and increase the chances of taking smarter decisions in various areas of life. Enhance your wisdom, knowledge and intelligence. Order Now!